Over 2,600 years ago, a massive solar storm hit the Earth. How do we know this? Recent ice core samples reveal traces of radioactive atoms. Scientists have seen these atoms before after solar flare events. For example, they found radioactive atoms in old tree rings and other ice core samples. The new research suggests that these solar storms may be different than the famous event of 1859. The Carrington Event of 1859 is the biggest solar flare event in recorded history. Telegraph lines shut down around the world. People in the Caribbean saw auroras in the night sky. 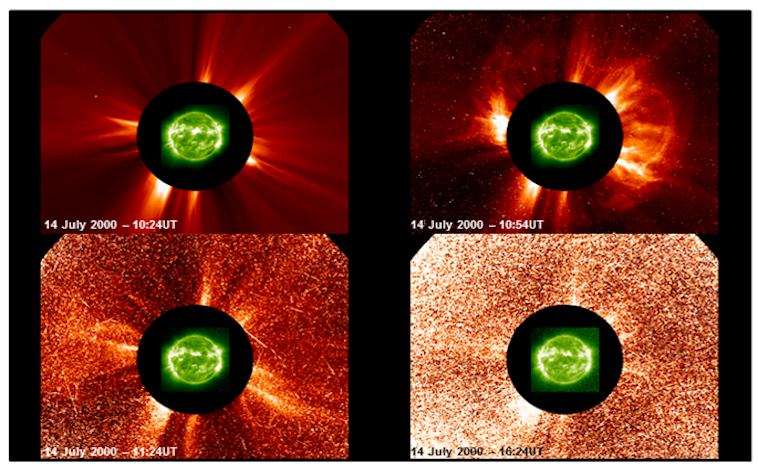 The flare was associated with a major coronal mass ejection (CME) that traveled directly toward Earth. It only took 17.6 hours to make the 150 million kilometers (93 million miles) journey. What made this event unusual was the amount of time it took to get here. Usually, a coronal mass ejection would take several days. In this case, it only took a few hours. Scientists believe that another aurora event cleared away the solar wind plasma. Now, researchers have found radioactive atoms trapped within ice in Greenland that suggest an enormous proton storm struck Earth in about 660 B.C. The scientists examined ice from two core samples taken from Greenland. They noted a spike of radioactive beryllium-10 and chlorine-36 about 2,610 years ago. Tree ring research around the same time reveals a spike of Carbon-14. Researchers use Carbon-14 to date organic materials from history. Previous research detected two other ancient proton storms. One storm occurred about A.D. 993-994 and the other A.D. 774-775. They believe that of the two, the 775 A.D. event was more significant. Senior study author Raimund Muscheler, an environmental physicist at Lund University in Sweden, suggests that these storms were ten times larger than the Carrington Event. In addition, his team can only speculate the magnitude of the protons involved at Carrington. What are the chances that the Earth will see another massive proton event during the next one hundred years? To answer simply, no one knows. Although researchers have located two large-scale solar events, they are still looking for smaller events. Smaller events would fall somewhere between the 993 A.D. event and the 1859 Carrington Event. As they delve more into their research, they hope to pinpoint the frequency of these events. However, what we know now is that at least three major events have occurred in the last 3,000 years. To put that into perspective let’s look at these points in history. In 668 B.C. Nineveh was the largest city in the world with close to 150,000 occupants. The first emperor to have a throne in Japan occurred in 660 B.C. In 775 A.D. Emperor Constantine V dies, and his son Leo IV takes the throne. In 994 A.D. a group of Vikings sailed up the Thames River and sacked London. Although the Carrington Event exists in the modern era, these other events happened in ancient times. A large scale proton event today would undoubtedly have devastating impacts on contemporary society. We are all interconnected with electricity and satellite systems. It will be interesting to see if they can uncover smaller events between ancient times and the mid-1800s. How Do We Know That The Earth is Round ?